As with most events UK Hand Knitting attend, we were joined by men on our stand at various times during our visit to last week’s Harrogate Knitting and Stitching Show. Just like other knitters they came to teach, to learn, to show off projects and in one case to prove he could produce a neater cast on than his wife. We are great believers that knitting and crochet are for everyone but some people are still surprised to see men knitting and some men report that books and magazines seem so female dominated that they can feel left out. So we were interested to see two books aimed a male knitters launch almost simultaneously recently. The two books are aimed at different audiences but perhaps one will suit a male knitter or would-be knitter that you know. Chef James McIntosh started knitting while suffering from severe depression and he credits his new hobby as a major factor in his recovery. He is now so passionate about what can be done with yarn and needles that he has written a book that he hopes will encourage other men to have a go. This a a comprehensive introduction to knitting with sections on the health benefits and the history of knitting before we are introduced to the “equipment” (note not “materials”) and the basic techniques. McIntosh gives lots of space to his explanations and recommends looking at online videos If his readers get stuck. Particularly useful is a diagram explaining how to read a yarn label – something many knitting books would benefit from. The patterns in the book are designed and ordered to build skills moving from simple wash cloths, through cosies, scarves and hats before tackling garments. Each pattern is clearly set out with information on knitting a tension square and colour-coded sizing on each. And if that isn’t enough McIntosh’s Nibble section contains a few dozen recipes for tasting treats to create for a knitting group or just to fuel some solo creativity. This would be a useful choice for a new or would-be knitter or someone looking for straightforward patterns for men’s sweaters. 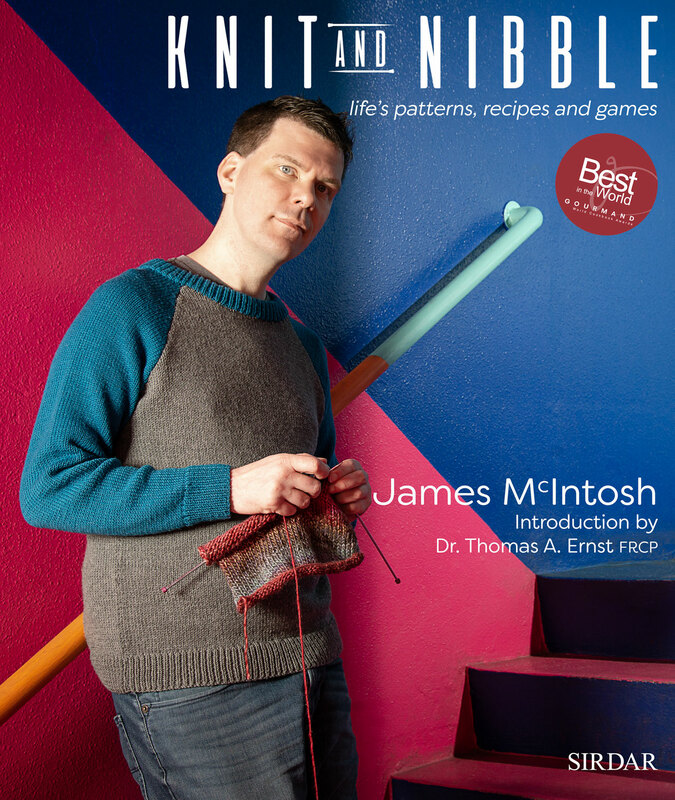 Sockmatician aka designer Nathan Taylor describes his book as a beginner’s guide to knitting. Taylor thinks men are put off from knitting because they think it all about “soft furnishings” and girlie activities so he emphasises the aspects of knitting that are associated with what he describes as “male brain attributes” – the maths, the engineering of needles and knitted objects, how patterns are created. Of course, these are things that also appeal to female knitters, so the book will have a far broader appeal. 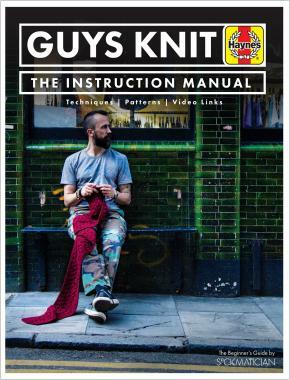 This is much more of a technical manual than a pattern book with the majority of the space given over to phototutorials and explanations of how different aspects of knitting work. You also have the option to scan QR codes associated with the tutorials so that you can find accompanying videos creating an interesting interactive experience. There is a lot of detail here and plenty from Taylor on what he has discovered works over the years, although he does tell us that every knitter needs to find the variations in technique and equipment that work best for them. Two of the most useful sections are on reading your knitting including counting and learning to recognise different stitches, and on spotting and fixing mistakes. The small section of patterns include a textured hat, a cabled scarf (both using charts) and a basic pair of socks – all patterns set to challenge but achievable following Taylor’s mantra of one stitch at a time. This is a useful technique book that would make a good addition to many knitters’ shelves regardless of whether they are women or men.